Growing up, I often listened to many aunties and uncles’ share their secrets to making smooth Chinese Steamed Eggs, but never had I tried one that’s as smooth as this pressure cooker one. Sorry uncles and aunties, but this one is sooo smooth that it’s even smoother than silken tofu and tofu pudding!! You seriously have to try it out. You can make this Chinese Steamed Eggs when you’re looking for something easy, quick, frugal, requires little ingredients, and great for kids and family. 1:2 Eggs to Chicken Stock Ratio in Volume (~2 eggs to 1 cup homemade unsalted chicken stock): the steamed eggs have super smooth texture that melt in your mouth (even smoother than Silken Tofu or Tofu Pudding/Douhua 豆腐花). The dish has light egg fragrance and taste. 1:1 Eggs to Chicken Stock Ratio in Volume (~4 eggs to 1 cup homemade unsalted chicken stock): the steamed eggs have slightly stronger egg taste and the texture is a bit more firm. Though the texture is not as silky smooth, the steamed eggs were still very smooth. It didn’t melt in our mouths like the 1:2 ratio though. We both prefer the 1:2 Eggs to Chicken Stock Ratio more as the melt-in-your-mouth smooth steamed eggs are really addictive to eat! So, use between 1:1 to 1:2 Eggs to Chicken Stock Ratio depending on your preference. Just make sure the total volume is at least 370 ml. *Did you notice there are a few slight cracks in the steamed eggs in the photo? These “cracks” were caused by the pressure from me gently pouring the sauce! YES!! The steamed eggs were THAT crazy soft!!! UPDATE: One of our readers’ pressure cookers doesn’t have the Low Pressure Setting, so we’ve decided to go back to the kitchen and try cooking it at High Pressure. 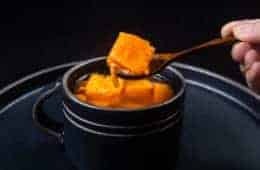 Now it’s YOUR turn to take out your pressure cooker and make some Steamed Eggs (Savory Egg Custard) Recipe! Make this super EASY 5-ingredient Chinese Steamed Eggs (Savory Egg Custard 蒸水蛋) Recipe. Silky smooth eggs literally melts in your mouth. Beat the Eggs: In a 2 cups glass measuring cup, beat 2 extra large eggs until egg yolks and egg whites have fully blended. Mix in the Chicken Stock: Slowly pour 1 cup of chicken stock into the well beaten egg mixture as you continue to mix. Optional: Add in ¼ teaspoon of sea salt. Mix well. Filter the Egg Mixture: In a shallow dish, pour the chicken stock egg mixture through a strainer. Remove the air bubbles on the surface with a spoon or a blowtorch. Tightly cover the dish with aluminum foil. Pressure Cook the Eggs: Place a trivet in the pressure cooker and pour in one cup of water. Carefully place the egg dish onto the trivet. Close lid and cook at Low Pressure for 6 minutes, then Full Natural Release (roughly 6 minutes). Serve: Open the lid. Carefully remove the aluminum foil. Garnish with green onions and pour the Soy Sauce Mixture onto the steamed eggs. Serve immediately. In Step 3: Covering the dish tightly with aluminum foil before cooking is a MUST!! The steamed eggs will turn out firm and crumbly if you don't wrap it with aluminum foil. It's important to taste & adjust the sauce according to your preference as different bottles of soy sauce or fish sauce (even for the same brand) have different level of saltiness. This will effect the taste of the final dish. Looking for more pressure cooker eggs recipes? 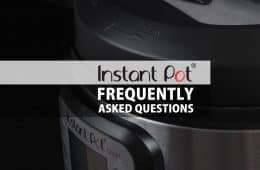 My instant pot auto turns to keep warm while natural release. Should I turn that off? Thank you for this! I tried this twice. The 1st time I used a bowl with too much insulation, but the 2nd time was perfect, even better than how my mom makes hers! I am wondering why you say “light” and not “low sodium” soy sauce. Is it just a matter of taste or does it affect the consistency? Thank you for your question. Just don’t want people to mistaken light soy sauce as low sodium soy sauce. It will be fine with low sodium soy sauce, but you may want to use a bit more. Can you please do an updated version using mince beef or pork. My kids like this very much, but i would like to change it up a bit. Thank you . For anybody that have issues with the eggs setting (eg still liquid) after the 6 minutes + NR, it’s most likely due to the bowl that you used. 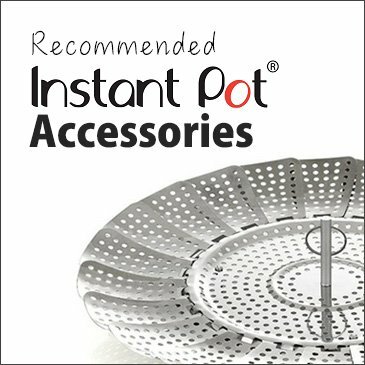 I used a thick ceramic bowl and it was still liquid when I opened the lid – switched to a stainless steel bowl and it set up just fine. Thanks for this great recipe – much easier than steaming on the stovetop! 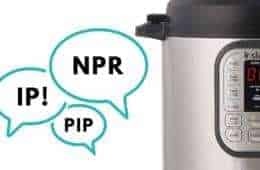 My instant pot doesn’t have a low-pressure function. What should I do to make this recipe work? You can use the high pressure manual button as well. Reduce the cooking time by a minute. Is there a set temperature for the pressure cooker? I have a different brand with options for temperature and I’m not sure which one to set it on. Another excellent recipe to add to my quick weeknight dinner repertoire. It reminds me of my mom’s home cooking. Thank you! 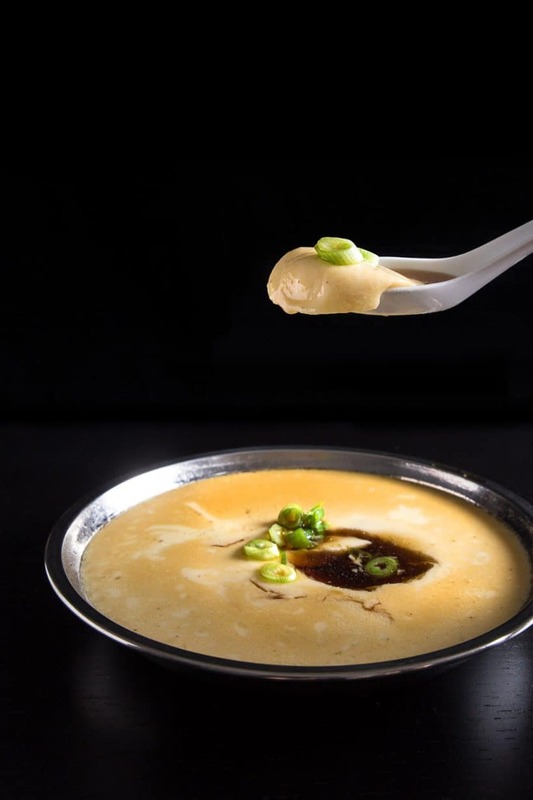 Have you ever tried to put additional ingredients into the steamed egg, like shittake mushrooms or dried shrimp? How will that affect the cooking time? If the shiitake mushrooms and shrimps have been re-hydrated, it will not take any longer. Any reason why you don’t use the steaming function? I made this 3 times now and sadly, I always end up with lots of bubbles inside the custard. Any idea what I’m doing wrong? It sounds like the egg was in direct contact with the hot steam. You will want to wrap it really tightly with aluminum foil. Sesame oil in the steel bowl is a good trick to add flavor and worked to prevent eggs from sticking!!! Thanks! A thin layer made it super easy to scrub off the little amounts of egg bits stuck after steaming- no more having to use two or three scouring attempts to get off all the stuck on egg! I’m trying to use less disposable items like Aluminum foil so I am using a stainless steel lid (that I received as a ‘middle layer’ in a stackable steel canisters for the instant pot) and putting that over my muji steel bowl with egg ingredients. It is true that the steam probably gets around the lid directly to the egg and the egg appears to shrink from the edges a bit and doesn’t have that nice perfect smooth to the edge custard look. But the core of the custard is smooth as silk. I used 1.5x the recipe you posted and six min low pressure + six minutes natural release works perfectly, I might even try less next time! Thanks again! Question: do you have a way to have a trick to keep the eggs from sticking to the stainless steel bowl? I’m experimenting with various times and volumes (2-4 eggs), salt (bouillon) and times on the Instant Pot. 4 eggs and 10 minutes left a perfectly custardy consistency. 3 eggs 1.5 cups stock and 8 minutes left the custard ‘bubbly’ (perhaps I scrambled too vigorously). I think decreasing the time will leave it softer, but the times to add to the instant pot for every egg/volume you increase is not linear and seems tricky since the instant pot only allows for 1 minute gradations, and one or two minutes more for sure completely changes the consistency! Any hints on this? Thanks again! I would add some oil to the stainless steel bowl if it is still sticking. For the 2nd time, I think the aluminium foil was not wrapped tightly enough so the steam was able to get in direct contact with the eggs. I would love to make a batch of this and have them on the go for breakfast. Any idea on how to reheat them? Steaming to reheat will be the best way. Thanks for your reply. No. I didn’t push down on the lid and always used the same container. What container do you suggest? Glass/ceramic/metal? Metal will work the best. When i first got the ip, i made this weekly. It was so good. Soon after that i made it again a couple of times and the texture just wont set. Its very soupy. So i put it back in the ip and same result although i followed the recipe to the T. I thought its a bad batch and a week after same result. Ever since that i have been hesitant to make it again? What went wrong? Was a different type of container used? Pushing down on the lid is one of the main reasons for undercooked food on the trivet. Comments require approval before they show up as there are way too many spam comments. It will work 🙂 I would recommend 8 minutes at Low Pressure + natural release. I made this today as per your suggestion and was perfect. Two jars each with 1 egg a bit additional egg whites and 1/2 cup stock, with lightly sealed lids, low pressure 8 min, NR! Thanks! Hey Amy & Jacky, if I were to double the recipe, do I need to add a few more minutes to the cooking time? Yes, you will need to add a few more minutes for this recipe. I would say roughly 4 minutes. Do you ever make this at the same time as making rice? I used to make this while cooking rice in a rice cooker. I’m trying to be more efficient with my cooking and cleaning so I’d rather be able to make the rice and steam egg at the same time. I just tried this tonight – for some reason the egg texture turned out very grainy (but smooth). So when you spooned it it is silky, but when you put it in your mouth it’s like eating grainy powdery stuff. Do you know why? I put in chicken stock as made from your chicken stock recipe – would it be because of that? The chicken stock shouldn’t be a problem. 3) The steamed eggs were overcooked. I grew up with my Chinese grandmother making a similar dish that had ground pork at the bottom of the bowl with the egg mixture on top. If I added meat to this, what would you recommend for the cooking time and pressure? I would recommend increasing the cooking time by 2 minutes. My mother always make that dish too! Hi Amy & Jacky, I tried this twice but needed to increase the time to 10 minutes. Does it sound right? Otherwise the egg will still be watery. In any case, it’s a wonderful recipe. Thank you so much! The cooking time will depend on the size & material of the container. Hi – Thanks for the post. If I use unsalted chicken stock from grocery store, will it taste the same? Or at least close? It will be quite close with unsalted chicken stock from grocery store! 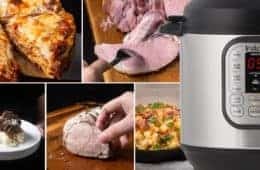 Is there a way to print out the recipe ? I can’t fine the print option. There is a black print button right above the ingredients list on the recipe card! 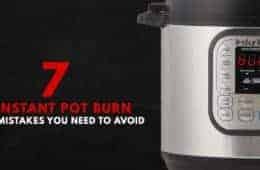 Since they have similarities I wonder if you two have made 燉蛋 in the instant pot also. I am experimenting making it at the same pressure and time as this savory egg custard but would love to know a specific pressure and time to cook if you know one! Also possibly because I made it in a ceramic bowl, the savory custard wasn’t set the first time I ran the instant pot, but I just ran it again at the same time and it came out delicious. thank you for your question and feedback. Ceramic bowl is thicker and will transfer heat a lot slower when compared to stainless steel bowl so it will need extra time as you suggested. I make a lot of bone broth so I’m going to try this! The problem is I get large eggs from my local farmers and rarely are they extra large. How can I adjust for simply large eggs? Also I’ve made milk custard successfully, but last night they curdled. I covered them with aluminum. Some are saying not covered tightly enough. They are in low mason glass jars. Any thoughts? Thanks for the recipe. Will be trying it today! Just make sure to use 2 eggs to 1 cup homemade unsalted chicken stock ratio and it will turn out fine! Yes, make sure to cover with aluminum tightly for milk or egg custard! This recipe is perfect! I’m Cantonese and this reminds me of my childhood. I try to avoid foil and found that a round heatproof silicone lid (small enough to fit inside the cooker pot but slightly larger than the dish rim) works perfectly. thank you so much for sharing your method with us. Take care and have fun cooking ? Your first part lists “1:2 Eggs to Chicken Stock Ratio” which sounds like 1 Egg to 2 cups Chicken stock. This resulted in non Cooked, crumbly and liquid Soup. But the video and later text states 2 eggs to 1 cup chicken stock (which is the opposite of the ratio write up and in the video. 1:1 also works great and is the super silly version while the 1:2 version is the firmer version. Do I have this right? I made it three times like the “1:2 Eggs to Chicken Stock Ratio” and it failed everytime until I did the video and bottom text write up. Love this dish and your description but just want to get the ratio right! Sorry for the confusion. 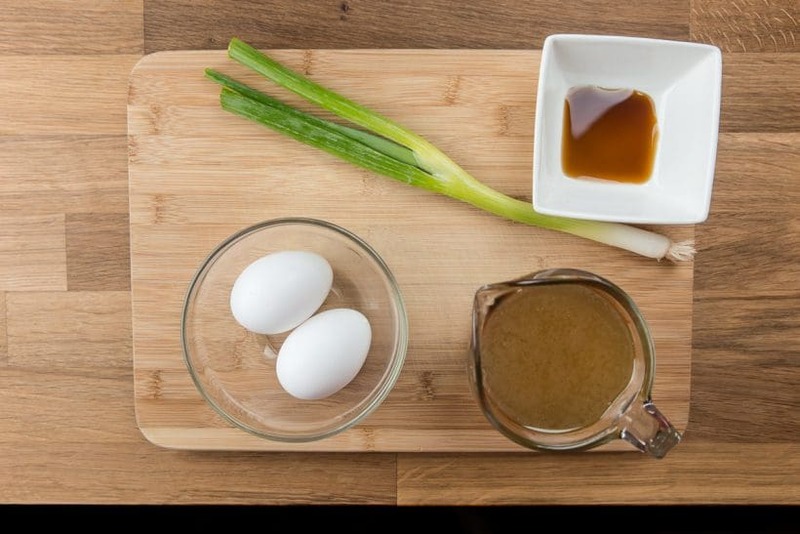 The 1:2 Eggs to chicken stock ratio does sounds like 1 egg to 2 cups of chicken stock. I will see how we can word it differently to avoid any confusion. The 1:2 Eggs to Chicken Stock ratio are in volume. One Egg is about 60 – 65ml. In the recipe card at the bottom, it says 250ml homemade unsalted chicken stock and 2 extra large eggs (~120 – 125ml in volume). This is what we meant when we said 1:2 ratio. Thank you for your suggestions and have fun cooking! This looks Soooooo good. I wonder if you could make a sweet custard using milk instead of chicken broth and adding sugar. Have you tried that at all? It will work 🙂 We have added it to our to-make list! Hi Jacky and Amy! I want to try this dish soon for my family, but it’ll have to serve more than two. Can I double or even triple this recipe in the IP. What would be the necessary adjustments that I would need to make in order to change the serving size? Thank you so much for all you recipes! I’ve already tried the beef stew and beef balogonese pasta with excellent results!! ? 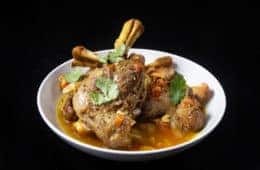 To double this recipe, you will have to increase the pressure cooking time to 10 minutes. I wouldn’t recommend tripling the recipe as the outer layer may overcook too much. I wonder if I use a ceramic or glass bowl vs the stainless steel bowl you have in the picture, if that would affect the cooking time? Thanks. This was perfect! Even better than my mom’s 🙂 thank you so much! thank you for your high praise!! Hello there! Jacky, Thanks for the response! I ran it again and it did cook through this time. But seems like there’s broth that separates out into the bowl as I’m eating the egg custard. Is that normal? Not exactly sure how it should look. I used a glass bowl maybe a little taller and more narrow than the one you are showing in your picture/video. It is made of Pyrex glass. It’s delicious! I’ll definitely try it again! Thanks for sharing your time with all of us! So very helpful and appreciated! Hello there! I just tried this with the Low Pressure function. It wasn’t cooked at all after about eight minutes NPR. It was liquid… I’m running it through again to see if I can get it to cook this time… But sure do wonder what could have gone wrong?!? I followed the recipe exactly. Used cold homemade bone bone broth. It was very gel… Maybe that caused it to not set up /cook correctly? I am thinking the sealing ring is not seated properly. May I know what material and how shallow is the container? Cold homemade bone broth shouldn’t be a problem as we have used that as well. Thank you so much for developing authentic Hong Kong home dishes, made even easier by the IP! As a Hong-Kong-American, I get homesick for homestyle dishes that I can’t find while living in certain parts of America. I’ve been looking for IP recipes when I discovered your blog. I combed through all of your Chinese recipes and came across this one and it brought back so many childhood memories. My mother would make steamed eggs for me once a week because it was my favorite dish and it was cheap. Thank you for making it possible to relieve happy memories through a simple recipe. We’re so glad you found us!! Steamed eggs is one of those dishes that brings back lots of childhood memories for me too. This came out absolutely delicious. Bonus is that this is a great way to use my homemade bone broth. Thank you so much for trying our Steamed Eggs recipe! Hi, can I use any shallow dish? Or does it have to be oven safe? Thanks. I’m so happy to see this recipe! I love steamed eggs (although the recipe from my mom differs from yours), and the silky texture! Thanks for the recipe- I can’t wait to try it! Thank you Tiphanie! We really love the silky texture of steamed eggs too! Beat the eggs well, and gradually add in the hot water, then add the salt & oil, and continue to beat. Bring water in steaming pan to a boil, add the egg dish, cover, then lower the flame to the lowest setting. Steam for 25 minutes. To serve, add 1 tsp of soy sauce and oil, and garnish with chopped green onions, if desired. Or, add about 2 tsp of oyster sauce. Sometimes, I also add dried vermicelli (bean thread), softened, to the egg dish before steaming. Enjoy!